Archer is a five-reel video Slot Game with a Robin Hood theme, featuring a male archer, his lady, gold coins and, of course, the all-important arrows scatter symbol. It is one of the first games to include the exciting �All-Ways� feature. This means that there are no paylines, but instead you bet on combinations between adjacent reels, starting with the leftmost reel. There are 243 possible winning combinations, all of which are active during the game. With the Expand and Split feature, it�s possible for two symbols to occupy one square simultaneously � giving you many more chances to hit a winning combination. Spin three Wilds on the reels and get seven free spins. You can retrigger free spins an unlimited number of times. The Scatter symbol substitutes all icons barring the Wild. Every time you score a win the Gamble feature is activated and you get a chance to double your gains. The Gamble reveals a simple Black or Red game where you predict the colour of the next card and if your guess is correct your booty is doubled. Spin five Robins on the reels and win a massive 1500 coins. You can choose coin values from 0.01 up to 5. The minimum bet is 25 coins and there being no paylines in this slot game you can win on any paying combination that you spin. 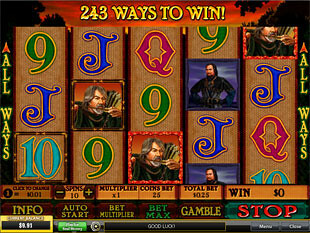 Use the Auto Start button for multiple spins and the Bet Max to play Archer Slots with the maximum bet multiplier. You can increase or decrease the Bet Multiplier from 1x to 10x.